In 1982 Massimo and Lella received the AIGA Medal for their many contributions to the design world. Below is an article which originally appeared in the 1983 issue of AIGA Graphic Design USA commemorating their accomplishments. It is republished here with kind permission from AIGA. The Vignellis, Massimo and Lella, stand at the peak of their profession. During the past 20 years, their design output has been prodigious in quantity, far-ranging in media and scope and consistent in excellence. Equally important is the influence they have had and the difference they have made. Their work has led by example. They have contributed to design as individuals. For their accomplishments, Massimo and Lella Vignelli have been chosen to receive the AIGA Gold Medal for 1982 — the sixty-second such award in a distinguished series that began in 1920. The Vignellis were both born and educated in the industrial, more-European north of Italy, he in Milan and she in Udine, 90 miles away. Massimo’s passion was “2D” — graphic design; Lella’s family tradition and training were “3D” — architecture. They met at an architects’ convention and were married in 1957. Three years later, they opened their first “office of design and architecture” in Milan and designed for Pirelli, Rank Xerox, Olivetti and other design-conscious European firms. But their fascination with the United States, which took root during three years spent here after they were married, eventually grew strong enough to lure them away from Italy permanently. “There is diversity here, and energy, and possibility,” recalls Massimo, “and the need for design.” He cofounded Unimark in 1964, which ballooned and collapsed as the corporate identification boom of the late 1960s hyperventilated, then ran out of breath. In 1972, their present office was formed: Vignelli Associates for two-dimensional design, Vignelli Designs for furniture, objects, exhibitions and interiors. Not only do the Vignellis design exceeding well, they also think about design. It is not enough that something — a chair, an exhibition, a book, a magazine — looks good and is well designed. The “why” and the “how,” the very process of design itself, must be equally evident and quite beyond the tyranny of individual taste. That sounds serious, and the Vignellis are serious about design. But it is seriousness of purpose conveyed most often through exuberance. When either Massimo or Lella says the word “design,” it is pronounced with a capital “d”: “Design.” As individuals and professionals, their commitment to design and their accomplishments in design have rewarded them well. The Vignelli office continues to thrive and assignments come from an ever more diverse range of clients. Graduates of their firm have set out on their own and established well-respected practices. Only a few of the best and brightest are hired out of the schools each year. Their calendars are crammed; their pace formidable. Originally published in AIGA Graphic Design 4, eds. David R. Brown, Wylie Davis, Rose DeNeve. Copyright 1983 by AIGA. I remember in the 80s watching a debate between Massimo Vignelli and Paula Scher at Cooper Union — this was the high point of the era when Swiss minimalism was very much out of style, so punky Paula was having a field day defending all things kitsch. At the time of course it seemed like both parties were from different planets but alas in retrospect I've come to realize that they're just both different sides of the design coin. And ironically all the kids today worship Swiss and I do admit that in my heart I yearn for the 70s subway map! 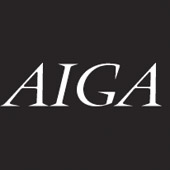 AIGA, the professional association for design, stimulates thinking about design, demonstrates the value of design and empowers the success of designers at each stage of their careers.